As the world begins its large-scale transition towards low-carbon energy sources, it is vital that the pros and cons of each type are well understood and the environmental impacts of renewable energy, small as they may be in comparison to coal and gas, are considered. In two papers—published in Environmental Research Letters and Joule—Harvard University researchers find that the transition to wind or solar power in the United States would require five to 20 times more land area than previously thought, and if such large-scale wind farms were built, would warm average surface temperatures over the continental United States by 0.24 degrees Celsius. "Wind beats coal by any environmental measure, but that doesn't mean that its impacts are negligible," said David Keith, the Gordon McKay Professor of Applied Physics at the Harvard John A. Paulson School of Engineering and Applied Sciences (SEAS) and senior author of the papers. "We must quickly transition away from fossil fuels to stop carbon emissions. In doing so, we must make choices between various low-carbon technologies, all of which have some social and environmental impacts." Keith is also Professor of Public Policy at the Harvard Kennedy School. One of the first steps to understanding the environmental impact of renewable technologies is to understand how much land area would be required to meet future U.S. energy demands. Even starting with today's energy demands, the land area and associated power densities required have long been debated by energy experts. 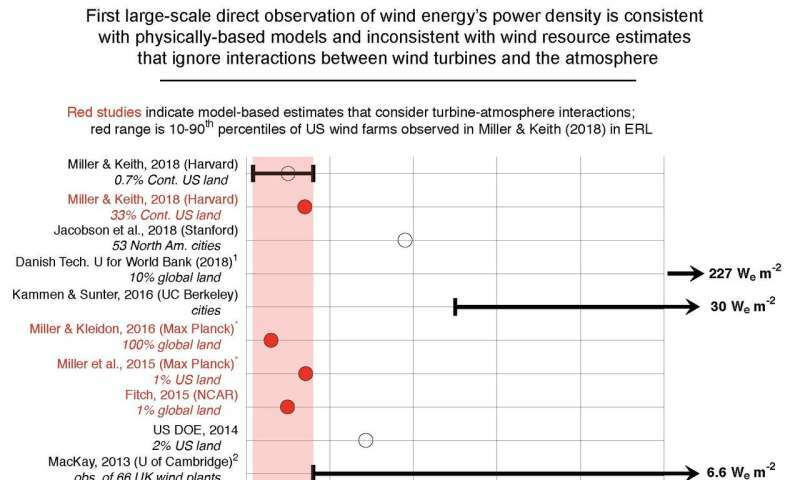 In previous research, Keith and co-authors modeled the generating capacity of large-scale wind farms and concluded that real-world wind power generation had been overestimated because they neglected to accurately account for the interactions between turbines and the atmosphere. In 2013 research, Keith described how each wind turbine creates a "wind shadow" behind it where air has been slowed down by the turbine's blades. Today's commercial-scale wind farms carefully space turbines to reduce the impact of these wind shadows, but given the expectation that wind farms will continue to expand as demand for wind-derived electricity increases, interactions and associated climatic impacts cannot be avoided. What was missing from this previous research, however, were observations to support the modeling. Then, a few months ago, the United States Geological Survey released the location of 57,636 wind turbines around the U.S. Using this dataset, in combination with several other US government databases, Keith and postdoctoral fellow Lee Miller were able to quantify the power density of 411 wind farms and 1,150 solar photovoltaic plants operating in the U.S. during 2016. "For wind, we found that the average power density—meaning the rate of energy generation divided by the encompassing area of the wind plant—was up to 100-times lower than estimates by some leading energy experts," said Miller, who is the first author of both papers. "Most of these estimates failed to consider the turbine-atmosphere interaction. "For an isolated wind turbine, interactions are not important at all, but once the wind farms are more than five to 10 kilometers deep, these interactions have a major impact on the power density." The observation-based wind power densities are also much lower than important estimates from the US Department of Energy (DOE) and the Intergovernmental Panel on Climate Change (IPCC). For solar energy, the average power density (measured in watts per meter squared) is 10 times higher than wind power, but also much lower than estimates by leading energy experts. This research suggests that not only will wind farms require more land area to hit the proposed renewable energy targets but also, at such large scale, would become an active player in the climate system. The next question, as explored in the journal Joule, was how would such large-scale wind farms impact the climate system. To estimate the impacts of wind power, Keith and Miller established a baseline for the 2012-2014 U.S. climate using a standard weather forecasting model. Then, they covered one third of the continental U.S. with enough wind turbines to meet present-day U.S. electricity demand. The researchers found this scenario would warm the surface temperature of the continental U.S. by 0.24 degrees Celsius, with the largest changes occurring at night when surface temperatures increased by up to 1.5ºC. This warming is the result of wind turbines actively mixing the atmosphere near the ground and aloft while simultaneously extracting from the atmosphere's motion. This research supports more than ten other studies that observed warming near operational US wind farms. Miller and Keith compared their simulations to satellite-based observational studies in North Texas and found roughly consistent temperature increases. Miller and Keith are quick to point out the unlikeliness of the U.S. generating as much wind power as they simulate in their scenario, but localized warming occurs in even smaller projections. The follow-on question is then to understand when the growing benefits of reducing emissions are roughly equal to the near-instantaneous impacts of wind power. The Harvard researchers found that the warming effect in the continental U.S. caused by wind turbines is actually larger than the effect of reduced emissions for the first century of its operation. This is because the warming effect is predominantly local to the wind farm, while greenhouse gas concentrations must be reduced globally before the benefits are realized. Millar and Keith repeated the calculation for solar power and found that it's climate impacts are about ten times smaller than wind's. "The direct climate impacts of wind power are instant, while the benefits of reduced emissions accumulate slowly," says Keith. "If your perspective is the next 10 years, wind power actually has—in some respects—more climate impact than coal or gas. If your perspective is the next thousand years, then wind power has enormously less climatic impact than coal or gas." "The work should not be seen as a fundamental critique of wind power," said Keith. "Some of wind's climate impacts will be beneficial—several global studies show that wind power cools polar regions. Rather, the work should be seen as a first step in getting more serious about assessing these impacts for all renewables. Our hope is that our study, combined with the recent direct observations, marks a turning point where wind power's climatic impacts begin to receive serious consideration in strategic decisions about decarbonizing the energy system." I've already mentioned repeatedly, here and elsewhere, that "alternative energy" systems impact the environment significantly, even more than "fossil fuels". In converting wind energy to electricity, a windmill removes some of the ability of the moving air to do work. But the wind does a great deal. It distributes seed, it moves topsoil, it moderates temperatures over large areas. In much the same way, solar farms, with their huge expanses of shiny reflective surfaces prevent clouds from forming or vaporize any overhead, they superheat dust particles in the air overhead, and they create a massive temperature disparity between the air and the ground. Already, solar farms are being said to cause city like "heat island" effects themselves. It is chemtrails that are ruining the atmosphere and depraving the weather. Until those are stopped, what is called "climate change' will only worsen. I'm not sure how this system is working. I placed a comment, but a sign came up saying commenting was closed on this article, even though it was only placed today and there were no other comments shown. Checking back on the article, I saw than, when I scrolled down, my comment was visible, but, if I went past the comment, nearer to the bottom, then scrolled back up, the comment was not visible. I'm not sure if the comment has been placed or not. "I've already mentioned repeatedly, here and elsewhere, that "alternative energy" systems impact the environment significantly, even more than "fossil fuels"." "Wind beats coal by any environmental measure"
did you fail to understand? Please be specific, so that we can address the failure in your education and help bring you up to speed.